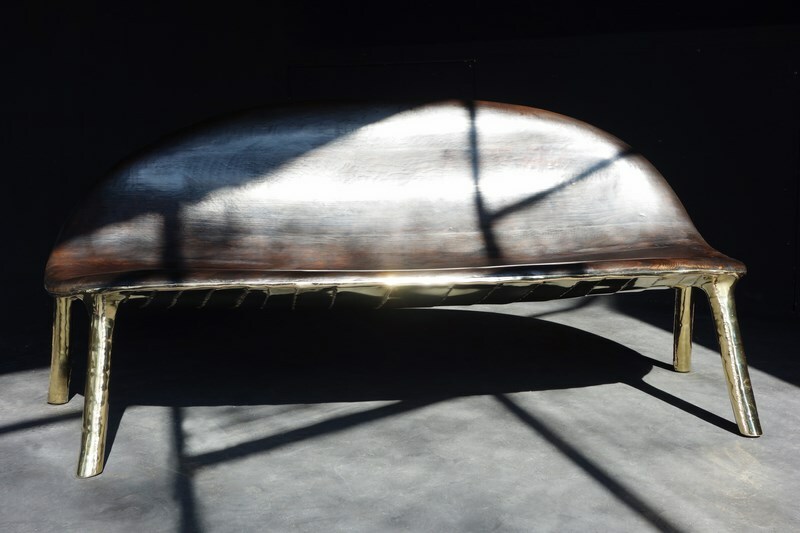 The 19th edition of PAD Paris is an eclectic mix of passionate connoisseurs presenting rare, limited editions and sometimes unique objects responding to a growing desire of collectors and enthusiasts to create exceptional personal statements. We had a little Q&A with 1st Dibs too! Galerie Maria Wettergren, is the leader in contemporary Scandinavian design. We greatly admire her work and have featured it several times on this blog. 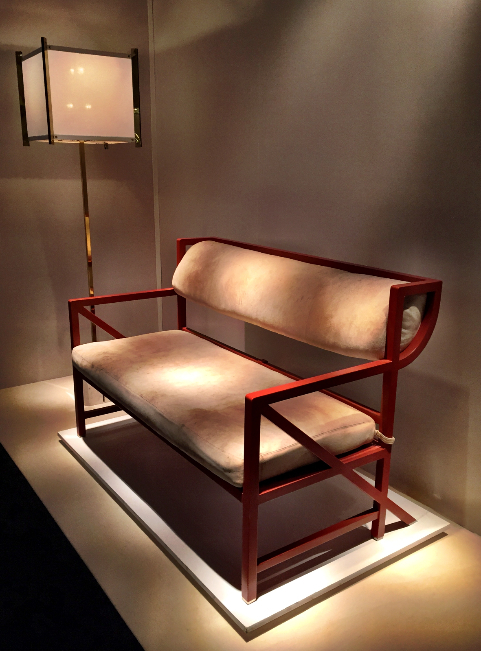 She presents new work by Danish designer Rasmus Fenhann this year …. 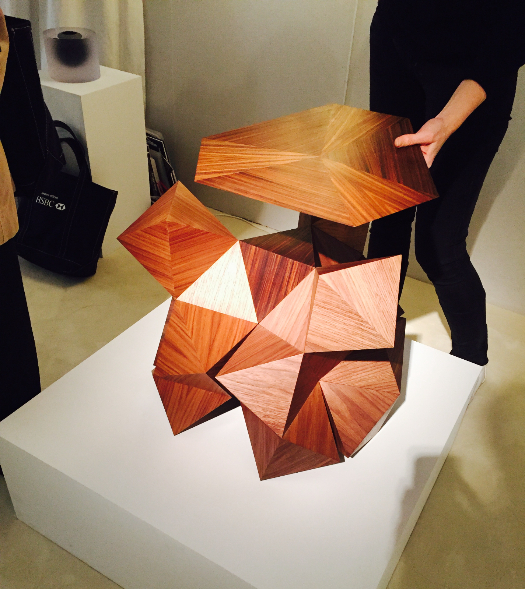 This sublime table (a limited edition of 8) with a removable top (shown above), is inspired by the principles in the Japanese art of origami. This highly covetable long bench in solid brass and burnt oak by Valentin Loellmann on the resolutely contemporary Galerie Gosserez’s stand stopped us in our tracks. Named ‘Spring/Summer++’, it is a continuation of Loellmann’s collection ‘Fall/Winter’, ‘Spring/Summer’ in which his fascination with materials is clear. 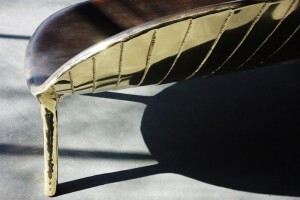 Having explored working in liquid bronze, hazel branches, coppered and nickeled metal and diverse patinas to spectacular effect in previous works in the collection, the juxtaposition of the organic shape of this bench with the deeply textured and waxed burnt oak and reflective brass is sublime. Each piece is unique and the quality of technique is outstanding. After a successful 1st experience last year presenting Victoria Wilmotte’s Magma collection of lava rock and colored resin furniture, Torri Gallery returns this year with the work of London-based French designer Fabien Cappello. The gallery gave him carte blanche to create a project specifically for PAD. 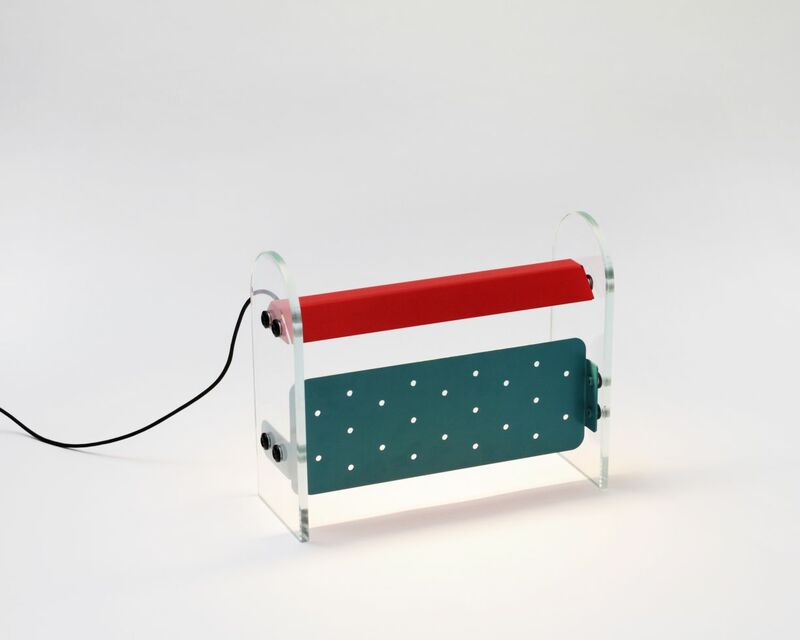 The result is a series of 6 lights in perforated metal and glass inspired by the 1980s. It’s called Bright Rays. Each design is available in a limited edition of six. We saw that two had sold opening day. The designers work has been recognized and rewarded in England and in France. He is interested in affecting change in the objects of our day to day lives and his work in general is “a strong reaction against the disposable culture.” He seeks to bring life and beauty to durable and significant objects for people.” His work injects a contemporary voice into the dialogue at PAD. 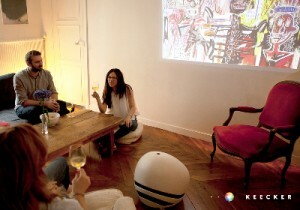 The Keecker, a robotic butler developed by former Google Product Manager Pierre Lebeau, is presented with Elle Decoration in the entrance of the fair. We told you this fair is eclectic! We thought you would enjoy this great article in the Huffington Post about Keecker. Images above: – 1. 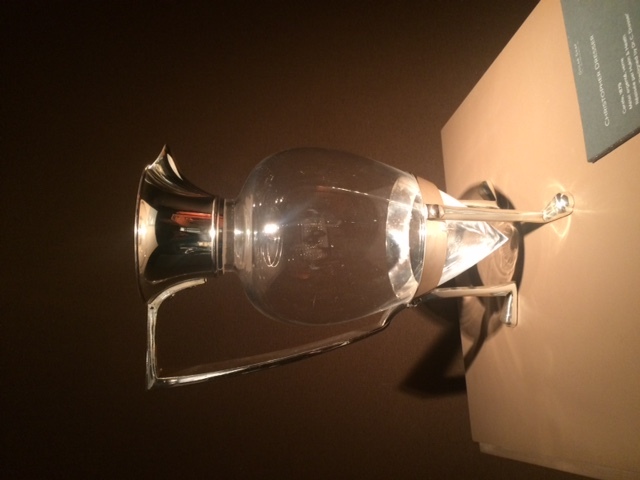 Carafe by Christopher Dresser, Oscar Graf Gallery. 2. 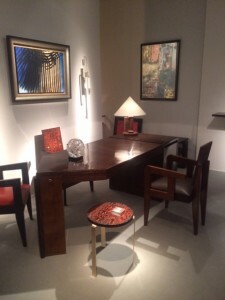 Furniture by André Sornay, Galerie Marcelpoil. 3. 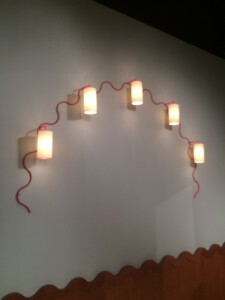 Lights by Jean Royere, Galerie Jacques Lacoste. Galleries including Oscar Graf, who is the leading specialist in Christopher Dresser, Marcelpoil who represents the work of Andre Sornay, Jacques Lacoste the leader in Jean Royere, and Galerie HP Le Studio, whose research on the Austrian architect Anna Lülja Praun uncovered this gorgeous bench (above) that had us so excited when we saw it at the press preview, are a few of the specialists who shared the stories of their work with us during the press preview. Lülja Praun was a great friend of Eileen Grey and her work is considered an important link between the Vienna Secession and Modernism in Austria. 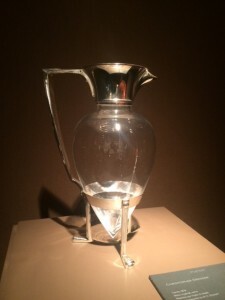 This piece was awarded PAD’s 2015 ‘Prix des Arts Décoratifs du XXème siècle’. 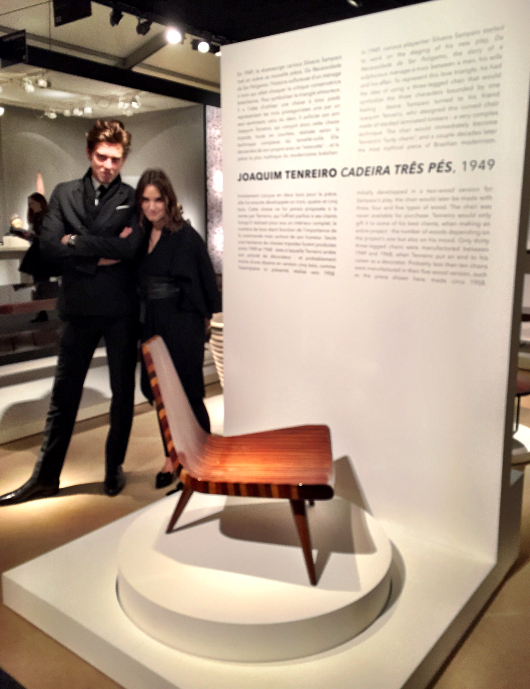 Paul Viguier and Candice Fauchon are the husband and wife team behind James Gallery Paris. 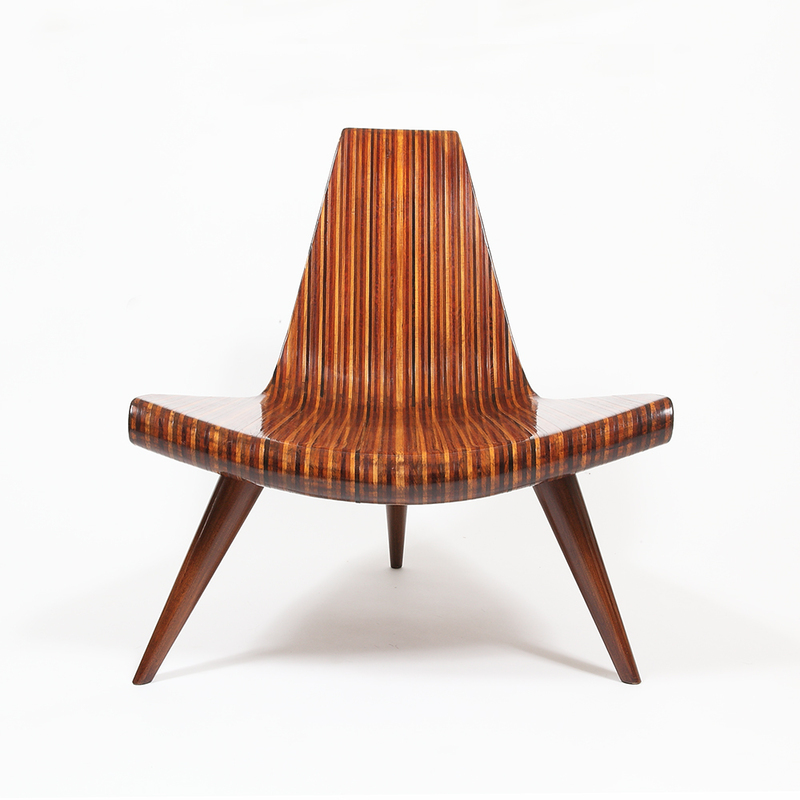 They present this incredibly rare and “most mythical piece of Brazilian modernism”- the ‘cadeira três pés’from 1958 by Joaquim Tenreiro. It was created for the first time in 1949 at the request of playwriter Silveira Sampaio, who was looking for a prop to represent the love triangle theme of his play. 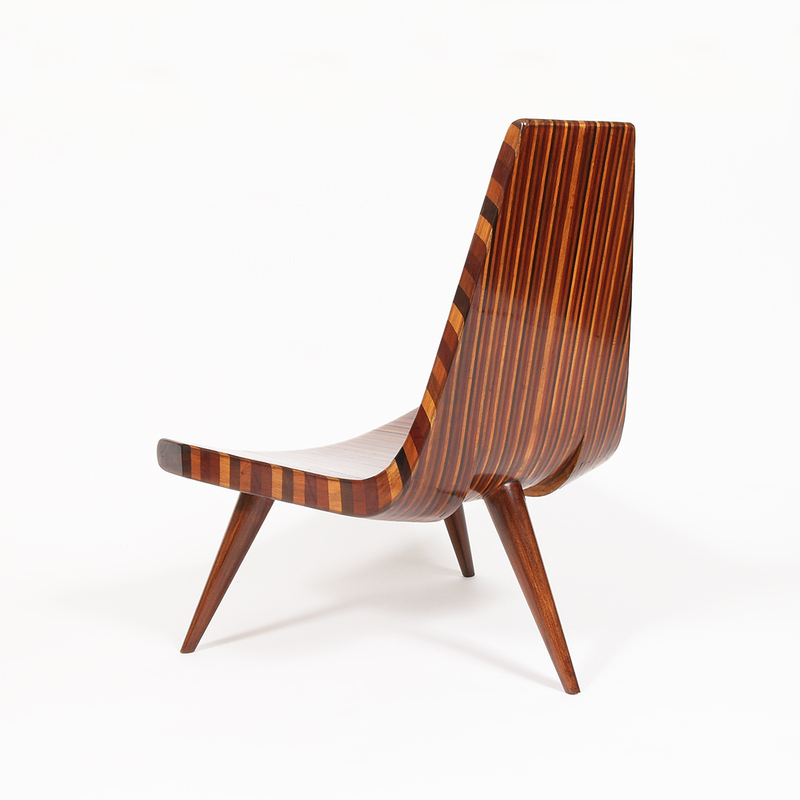 Tenreiro made 30 of these chairs over a 20-year period. He gave them as gifts – they were never sold. Created in combinations of 2,3,4 and 5 exotic hardwoods stacked together, this 5 wood version is incredibly rare. 1stdibs has sponsored both PAD Paris & London for the past four years. Why is it important to you to sponsor this fair? We view fair sponsorship as a way to support our dealer community and the antiques industry as a whole. Specifically, PAD brings together such a thoughtful mix of dealers and styles that the fair is a true shopping destination for design connoisseurs. 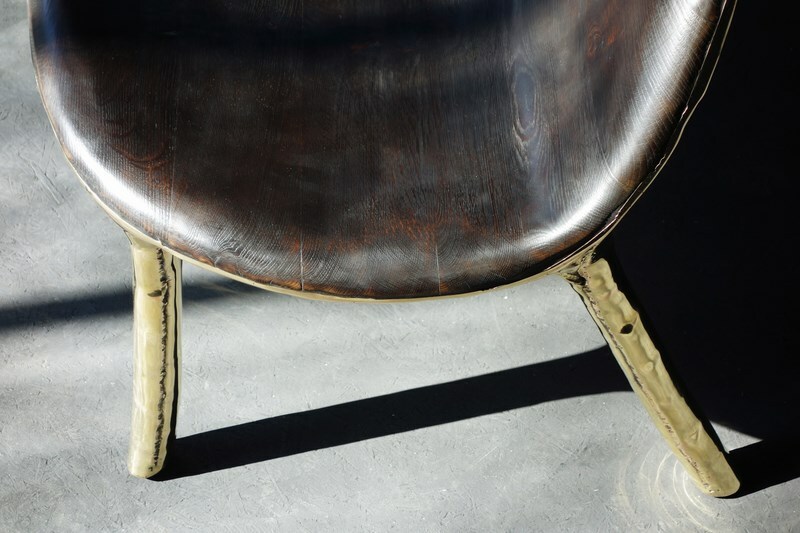 The range of periods and type of pieces found at the fair – from contemporary to modern –speaks to the way people collect and live today, and this makes the fair particularly appealing to our clients. PAD seems to be including more young galleries with contemporary design in the past few years. Is this a theme you see in your business as well? Absolutely. Many of our existing dealers are incorporating contemporary design into their offering. You can see this with galleries such as Galerie BSL, R. & Co, Salon94, and others. They are carrying works by designers like the Haas Brothers, David Wiseman, and Carol Egan. This is because people today tend to collect across a variety of styles and periods rather than staying within one genre. Today’s collectors like to mix new with old – modern with antique – and create interesting juxtapositions within their homes. Can you speak about some of the success stories you have seen as a result of your company bringing design and antiques to a global market. 1stidibs began as a listings site, similar to Craig’s List. As the site grew, we had amazing brand awareness within the interior design industry and the world’s best supply of premium products within our categories. However, until about three years ago 1stdibs had not evolved to take advantages of some of the fundamental changes in the Internet. These changes include the ability to buy online, to shop through a mobile app, and to do all of that on a global, rather than a primarily US, basis. Today, we are seeing major collectors making purchases through our platform from dealers all over the world. The average distance between a buyer and a seller on our site is 2000 miles, and people come to us to start art collections, furnish their homes, and to buy their engagement rings. This is a huge success for us and we look forward to evolving and growing even further. Do you see a movement towards one category or another? Are there any themes in collectible design that you are excited about now? Whether it’s a very rare Hermes handbag, a one-of-a-kind diamond ring, or a finely constructed Art Deco floor lamp, we are seeing great demand for extremely unique items that are rarely found on the market, regardless of price point. Ultimately – our clients want something that no one else has – that speaks to their own taste and personal style, and that says something about who they are as an individual. We will continue to meet this demand by adding more dealers, adding new international markets, and expanding into 21st century. Mark your diaries ahead of time for the ‘Le Corbusier, Measure of Man’ exhibition at the Pompidou Centre (29 April – 3 August). The exhibition, organized in collaboration with La Fondation Le Corbusier, will focus on how the human body itself helped define architecture and spatial composition for Le Corbusier and will include sketches, photos, audio, films, models and reconstructed interiors. ArtParisArtFair is this year showing only three design galleries: Armel Soyer, L’Eclaireur and Carpenters Workshop Gallery. All three have strong stands: Carpenters concentrated on works by L’Atelier van Lieshout, L’Eclaireur had some spectacular hanging lights by Vincenzo de Cotiis and Armel Soyer showed beautiful pieces by Pierre Gonalons (click here for our previous blog post on Gonalons), Matthias Kiss (previous post), Ifeanyi Oganwu, and Xavier Veilhan pour Akonite. The Fair has organized a good broad program of events in their VIP program. We attended their round table Forum ‘Du design à l’objet d’art, les nouvelles technologies à l’amorce de la création’ today. Those participating were Elodie Palasse Leroux (founder of Sleek Design), Mikael Zikos (IDEAT magazine), artists Cécile Le Talec and Miguel Chevalier and Alexandre Fougea (professor at l’Ecole Superieur des Arts Decoratifs and designer fondateur of Akonite skis). 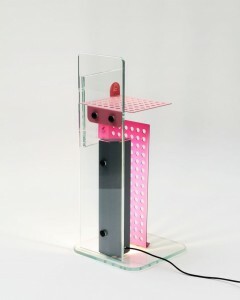 The subject explored was the myriad possibilities which modern technology has opened up for designers. The idea that “form follows information” and that technique and technology now often go hand in hand was explored. The tools that contemporary designers have, such as computer generated algorithms are increasingly combined with the strong traditions of great craftsmen in a way that continues the narrative in a totally contemporary context. A very inspiring and exciting forum!